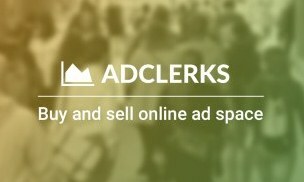 AdClerks only takes a small commission from the ad and you can be rest assured that you are getting paid for your traffic. The self serving platform is easy to use and it saves a lot of time and energy. You can see detailed stats in your account. Usually payments are sent on Net 30, but you can also request money from your account. Payments are sent via PayPal. This Advertising Network has not submitted their Payment Proof as of now. If you have got paid from this advertising network, you can send us the screenshot to support(at)alladsnetwork.com with the subject of AdClerks – Payment Proof. We will update this field once we receive the Payment Proof. The good thing about AdClerks is that it gives higher revenue and commission that they take is less, which means you are paid a larger revenue share. Support staffs are really good. Marketplace will need to attract a lot of advertisers at the moment. Payments can be requested any time.